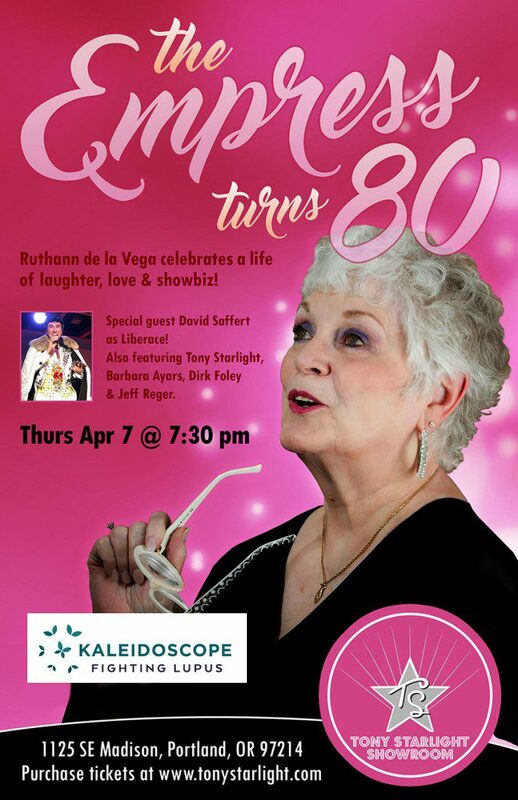 One of Tony’s favorite cabaret singers turns 80 and we are celebrating! Hosted by Tony Starlight, with special guest David Saffert as Liberace, plus other guests. The event is a benefit for Kaleidoscope Fighting Lupus, a non-profit organization whose mission is to EDUCATE the public and to INFORM the medical community about lupus, to ADVOCATE for earlier life-saving diagnoses, to SUPPORT people living with lupus and to COLLABORATE with government and foundations to fund research toward a cure. Ruthann lost her daughter Kandi Clark in 2005 to Lupus and all contributions to Kaleidoscope Fighting Lupus will be in her memory.